We spent the second week of our summer family trip to Thailand on the island of Koh Samui, in the Gulf of Thailand. My husband, our kids (15 and 20) and I stayed at a marvellous luxury resort, The Tongsai Bay. Our stay was arranged by Kuoni. 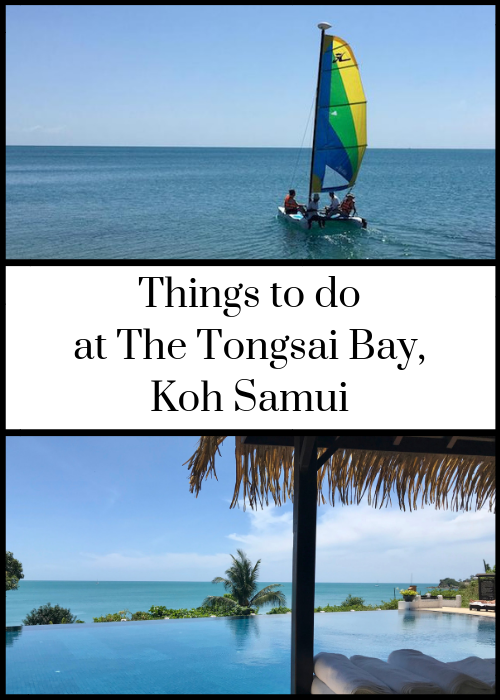 I’ve already written about what it’s like to stay at The Tongsai Bay, and about a Thai cooking class which we did there. This post is a review of the array of things to do at the resort – although if you don’t want to do anything much, you could easily just spend your time relaxing and sunbathing in peace at The Tongsai Bay. It’s that kind of place. I’ve separated the activities into those which are complimentary for guests, and those for which there’s an additional charge. All of these activities were available at the resort when we visited, but obviously the programme can vary from time to time. There’s a free weekly Thai culture and language class for Tongsai guests. My husband and I like trying to learn local phrases when we travel, so we signed up for this straight away. There were six of us in the class. Our very patient instructor, Euw, gave us a booklet of Thai words and phrases and got us to practice some of them. She also explained the different Thai Wei – the gesture of putting the hands together for respect when talking to someone. I found it quite hard to pronounce the words, but it was a very interesting and enjoyable session. 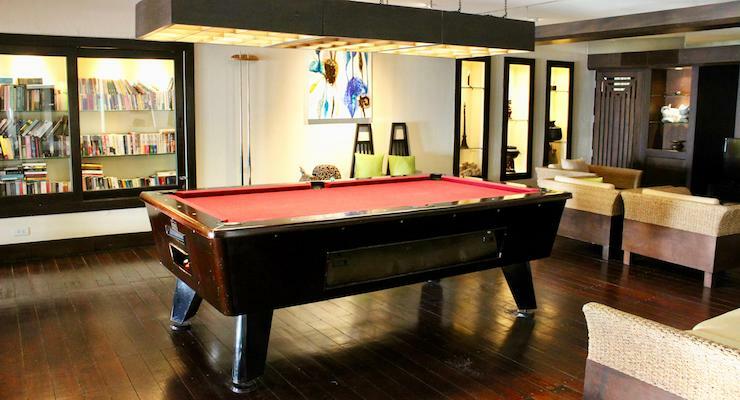 There’s a full-size pool table in the air-conditioned Ga-La room by reception, and it’s free for guests to use. The room has comfortable sofas and armchairs and bookshelves and is very welcoming. We’d never played pool together as a family before this trip, but here we played most evenings after dinner. We enjoyed it so much that we were even thinking about getting a pool table at home, before we’d worked out how much space it would take up. The Tongsai Bay is a good place for spotting local wildlife. The resort aims to exist in harmony with the natural environment, and was originally constructed without cutting down any trees. Consequently it’s a haven for wildlife. More than 67 different types of birds have been spotted here to date – in the lobby there’s a hand-made guide showing each of these birds. There’s a gecko house high up on one of the walls of the main restaurant, where the lizards can shelter, and we saw a large monitor lizard on a path while walking to breakfast one morning. Although we didn’t see any, we were told that dolphins visit the bay. If you want to catch up with newspapers and magazines from around the world, you can do so here. I downloaded the UK Sunday papers on the hotel’s PressReader app – it gives guests free access to thousands of newspapers and magazines. We found the wifi around the resort to be very good, and it was quick and easy to download things. I caught up on the news from back home whilst lying on a sun lounger by the beach. Guests can borrow books from the bookshelves in the Ga-La room, where the pool table is. 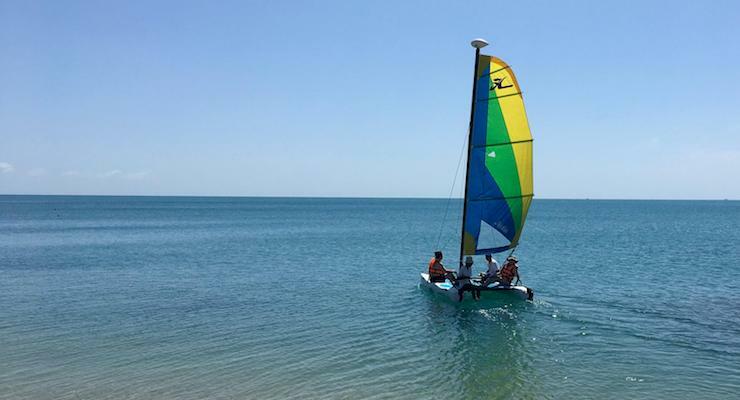 Sailing, canoeing, SUP and snorkelling equipment is available for guests to use free of charge, and life jackets are provided. If you know how to sail, you can take the boat out by yourselves, otherwise an instructor will take you out. When I tried snorkelling here I couldn’t see much as the water was quite cloudy. Canoeing was fun, and sailing (with an instructor) was very peaceful and relaxing. There are no motorised water sports in the bay. 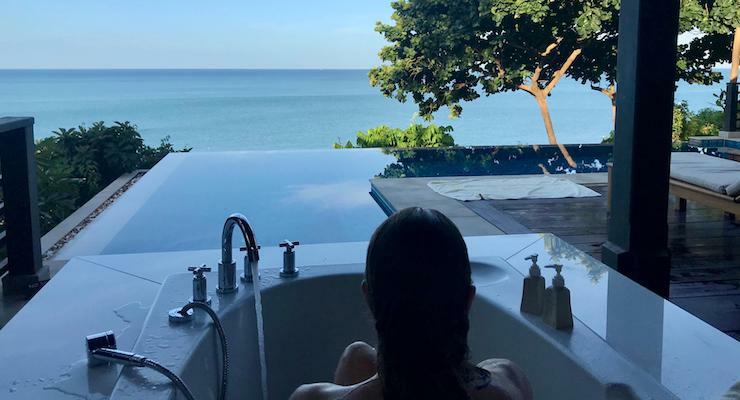 Many of the Tongsai suites, cottages and villas have a bathtub on the outside terrace, which means that you can have a bath while looking out at the sea or up at the stars. Swimming is my favourite kind of exercise, and I loved swimming at The Tongsai Bay. The resort has two large pools: a half-moon infinity pool for over-15s only, and a 60-metre pool next to the sandy beach. The pool by the beach has some shaded areas with underwater seats and sloping sides so you can kind of lean back under the water. Some of the cottages and villas also have private pools. The infinity pool at the amazing villa where we stayed is around 10 metres long, and enjoys panoramic views across the bay. You can also swim in the sea here – there’s a lifeguard, and when we visited the water was warm. When I swam in the sea I saw some small fish swimming nearby. Once a week staff set up a screen on the beach for a film night under the stars. There are giant beanbags to sit on, and cones of popcorn to sustain you while you watch the movie. We were very disappointed to have missed this! Once a week there’s a cocktail party on the beach for guests, with a complimentary selection of beers, spirits and cocktails. There’s a compact and well-equipped gym (known as the Exercise Room) next to the main pool. My husband and son used it a few times while we were there, and they were happy with it. They used the running machine and the weights, and they usually had the place to themselves. We didn’t spend any time in this room, but it would be a good space for younger kids to have a break when it’s hot. 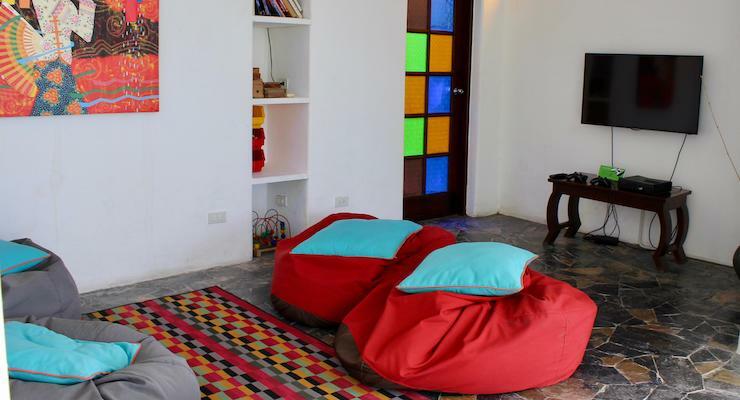 The Sip room is a bright and welcoming air-conditioned games room, with bean bags, an XBox 360, wooden toys for small kids and a table and chairs. If you’d like to watch a film in your room, there’s a DVD player, and the resort has a selection of DVDs available for guests to borrow. The Tongsai has a floodlit tennis court for guests to use free of charge, with rackets and balls provided. There’s an outdoor table tennis table by the Exercise Room, with bats and balls provided. 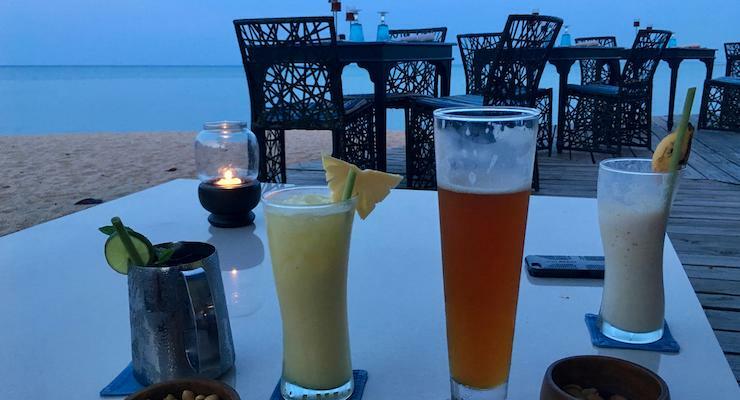 Each evening the resort’s Po Lad beach bistro has a happy hour, where drinks are half price. The four of us watched the sunset from here most evenings, sitting on sofas by the beach, drinking cocktails (mocktails for our 15 year-old) and making plans, before heading to one of the restaurants for dinner. Mine’s a mojito, if you’re asking! 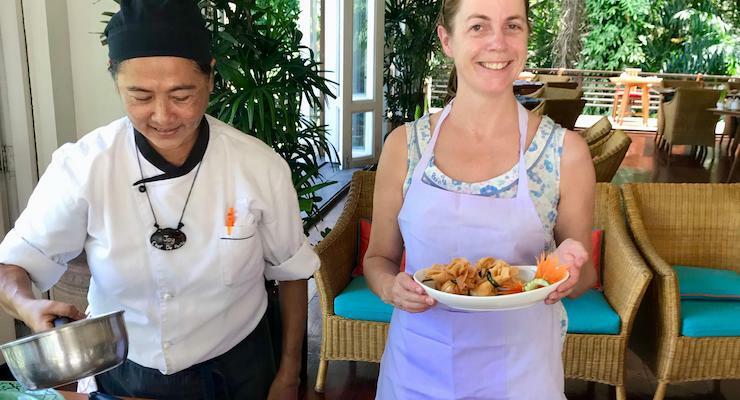 We were invited to take part in a Thai cooking class during our stay, and it was a fantastic experience. With guidance from Chef Joy and her team of helpers, we cooked a five-course Thai feast. My daughter and I cooked a vegan version, and my husband and son made meat versions of the same dishes. At the end of the class we got to eat our creations, and Joy gave us each a recipe book so that we could make the dishes at home. 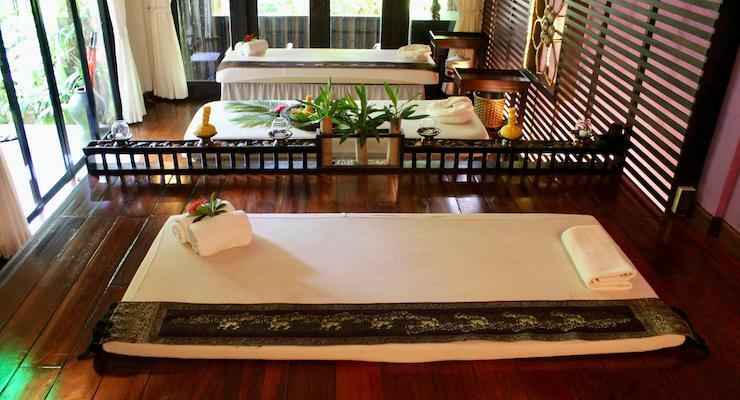 The resort’s Prana Spa is truly a haven of relaxation. I was invited to have a collagen facial while I was there, and it was just divine. At the time I was having problems with my skin, but after this soothing and gentle facial it felt very much better. The spa also has a couple of massage huts next to the beach, and I had an amazing Thai massage there on our last full day at the resort. It was an experience which involved being pulled, pushed, stretched and pummelled, but it felt good. There are Muay Thai boxing classes in the yoga room for up to four people per session. There’s a large yoga studio at the resort. There are scheduled group classes and you can also book private classes at other times. You can book a holiday at The Tongsai Bay with Kuoni. At the time of writing they’re offering packages from £1,427 per person for seven nights, including flights, transfers, room and breakfast – but obviously the price varies according to the season. Or you can book independently with The Tongsai Bay and make your own travel arrangements. We travelled to Koh Samui by ferry from the mainland, then at the end of our trip we flew from there to Bangkok with Bangkok Airways, and from Bangkok to London with British Airways. If you want to travel independently you can book flights with Skyscanner. 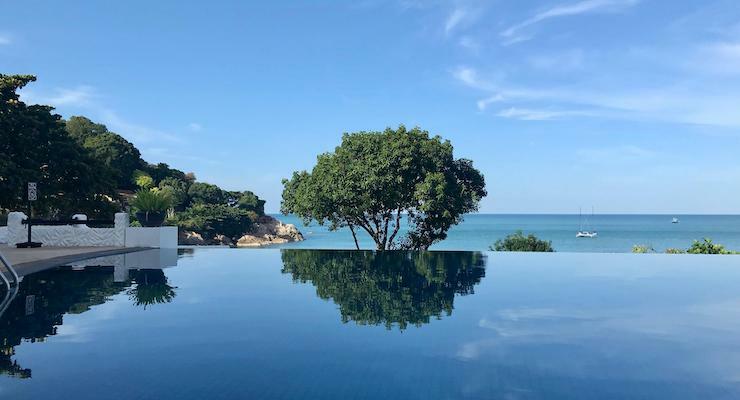 What’s it like to stay at Elephant Hills, Thailand? If you’d like a guidebook for Thailand, I recommend Lonely Planet Thailand , which we used. *Disclosure: This post contains some affiliate links, which means that if you clicked through and booked I may receive a small commission. We were hosted by The Tongsai Bay and Kuoni for five nights on a B&B basis for review purposes. Our cooking class and my facial were offered free of charge, for review purposes. We paid for our own flights, meals (apart from breakfast) and other expenses, and for two nights at The Tongsai Bay. All opinions, words and images are my own and are completely independent, as ever. One of the best part of traveling is getting to taste and savor of all kinds of new and delicious foods.Whether you,re driving across the state or flying across the world.And without a doubt its fun to let go a little and eat thing you wouldn’t normally eat during a week at home that’s part of freedom and excitement on being a vocation.